“Is there any hope of my online store being successful as long as Amazon exists?” The ugly truth — unless you’re Jeff Bezos reading this, in which case, Hi Jeff! — is that you can’t, and that’s okay. It has to be, because what’s the alternative? If there was no hope of competitors being able to succeed, shopping platforms like BigCommerce and Shopify would close up shop and call it a day … yet they not only continue but thrive. In an article on the Kissmetrics blog called “How E-Commerce Companies Can Compete in an Amazon-Dominated World”, Neil Patel talks about various ways that ecommerce merchants can co-exist, not compete, with Amazon. The fitness nutrition category is crowded, with many major players. 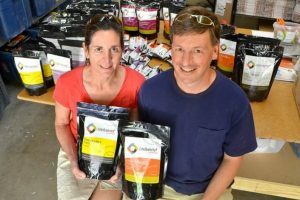 Tailwind Nutrition’s products address a niche within that niche: nutrition problems faced by endurance athletes in events like 50-100 mile races, 24-hour races, and multi-day events. As athletes themselves, Jeff and Jenny created products out of needs they had, backed by experience, research and testing. In describing the many benefits of their product line, they stress health and performance factors, customer feedback, convenience, and value in an easy to read, relatable (and humorous) way. Oh, and their products taste good, too. As multi-channel sellers who do sell on Amazon as well, Jeff and Jenny recommend determining SKUs/product assortments that are only available on your site and not on Amazon, like their Tailwind Gear. Creating an air of exclusivity increases time on site by keeping people from searching elsewhere for products that they will not find outside your website. Amazon Prime has made free shipping not only desired but demanded by consumers. However, Patel’s article quotes GeekWire as reporting that “Amazon lost $7.2 billion [Note: that’s billion. With a b.] from shipping in 2017 between what it cost them and what they charged. But they have more than enough revenue from other sources to make up for it.” Do you? Probably not. While totally free shipping is out of reach for many online stores, encouraging customers to meet a purchase threshold provides enticement to purchase more items to meet that goal. If your price points — or bundled products — make it easy for customers to get to your free shipping threshold, all the better. At the top of every page on Tailwind’s site, GET FREE SHIPPING ON ORDERS OVER $49 is displayed. On checkout, a message is displayed indicating if the cart contents do not yet meet the minimum threshold for free shipping, which helps increase AOV by encouraging additional purchases to meet this criteria. This is where Tailwind really shines. As a regular contributor to BigCommerce’s Critique My Site forum, I look at a wide variety of ecommerce websites every day, offering constructive criticism and our development services to online stores. Tailwind Nutrition contacted us for some development help, and in my initial evaluation of their site I noticed not only their awesome images and clean layout, but the way they create a unique experience for their customers. I was struck by some of the special touches that they add to their customer experience that provide a snapshot of the values they hold dear, namely: their customers matter. Personalized products & notes? Yes! Tailwind Nutrition’s brand bleeds through every customer interaction and touchpoint to create and solidify their identity. Tailwind has invested in their own website and social media channels to create a presence that helps set them apart from their competitors. 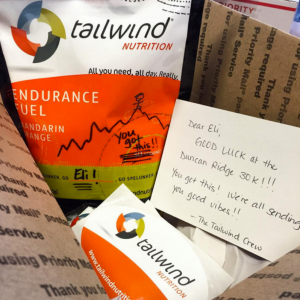 What are the things that Tailwind Nutrition does that Amazon does not? Each of their endurance drinks is personalized with their customers’ first name, creating a one-of-a kind experience. A handwritten note is included with each order, so the customer feels seen and valued. Jenny told me, “We actually have customers who continue to purchase directly through us because of the notes.” Now that’s an endorsement! As of this writing, Amazon does not currently send handcrafted responses to their customers. If they could swing it, they probably would — I’m sure they’ve got people working on it! But in the meantime, get busy and do the thing they cannot do: get personal. So, perfect marketing to your niche or target customer, improve your shipping, and level up your customer service game. While you can and should automate lots of processes, you can’t automate sincerity, passion, enthusiasm, and love for your customers. Is this easy? No. But it can be done, and done well if you have a plan and give that plan time to work. Like losing weight or changing any other behavior, the results of the methods you have used to get where you are now can’t be seen overnight. But change your methods right now and start going in the direction that will lead to success.